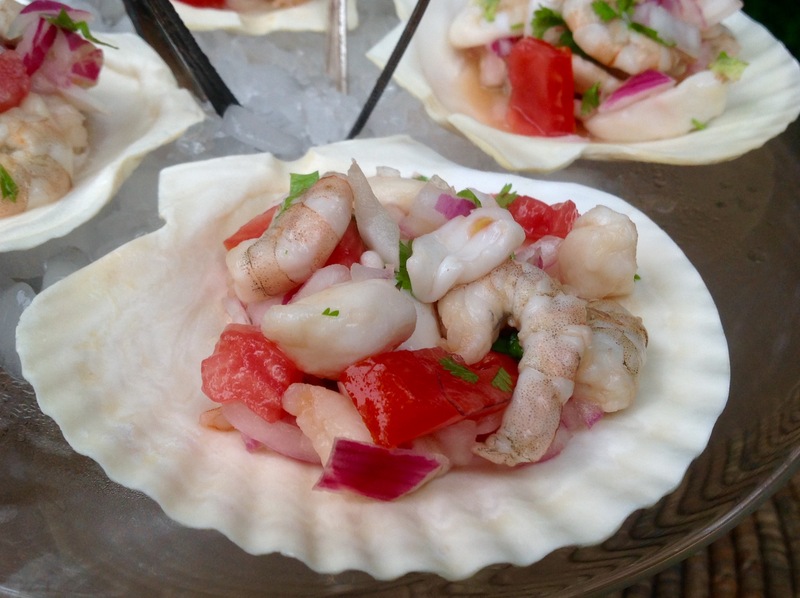 Ceviche is a seafood dish that is cured in citrus and served ice cold. It originated in Coastal Latin America and the Caribbean. It is the perfect summer appetizer because it can be made a day ahead and requires no cooking. Choose mild flavored fish and cut it in similar sizes so it cures evenly. I used a mixture of bay scallops, small shrimp and calamari rings. Trader Joe’s sells 1 pound bags in the freezer section which are perfect for ceviche and don’t require cutting. I cured mine in lime juice and a splash of orange muscat champagne vinegar. After curing, some chopped tomato, a splash of orange juice and fresh cilantro is tossed in for an easy appetizer. I prefer my ceviche simple where the seafood shines but sliced olives and cubed avocado can be added. 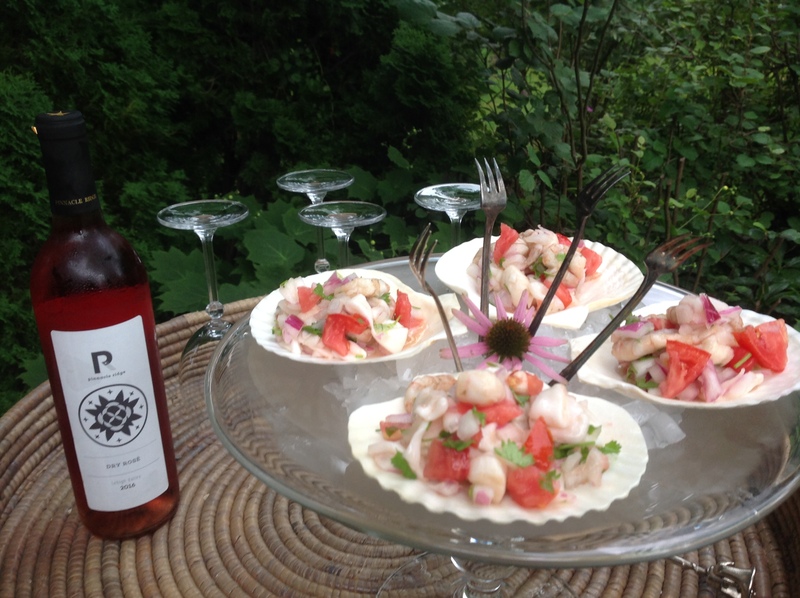 Serve with a cold Chilean Sauvignon Blanc or a crisp Rosé. In a non reactive glass bowl, toss the seafood with the onion, lime juice and vinegar, if using. The seafood must be covered by the juice and floating loosely so that the citric acid can cure the fish evenly. Cover and refrigerate a minimum of 4 hours, stirring once or twice. Drain in a collander and return to the bowl. (If you are making it ahead, refrigerate the drained seafood at this point and resume the recipe when ready to serve it. )Add the chopped tomato, salt, orange juice, chopped jalapeno or hot pepper flakes, if using, and cilantro. Serve icy cold in a large bowl alongside tortilla chips or in small appetizer plates with cocktail forks. I served ours in scallop plates over crushed ice. 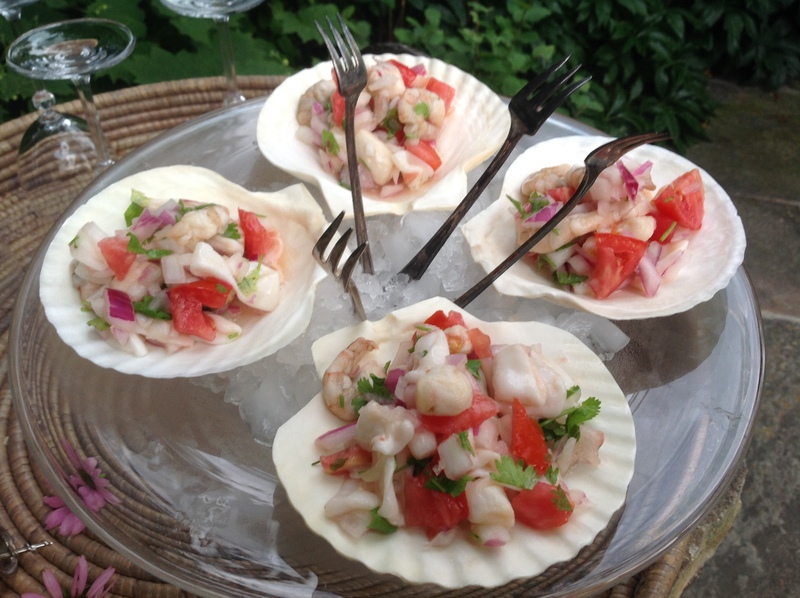 This entry was posted in Recipes and tagged Ceviche, ceviche appetizer, easy ceviche, no cook seafood appetizer by Johanne Lamarche. Bookmark the permalink. This is so beautifully presented!!!!!! 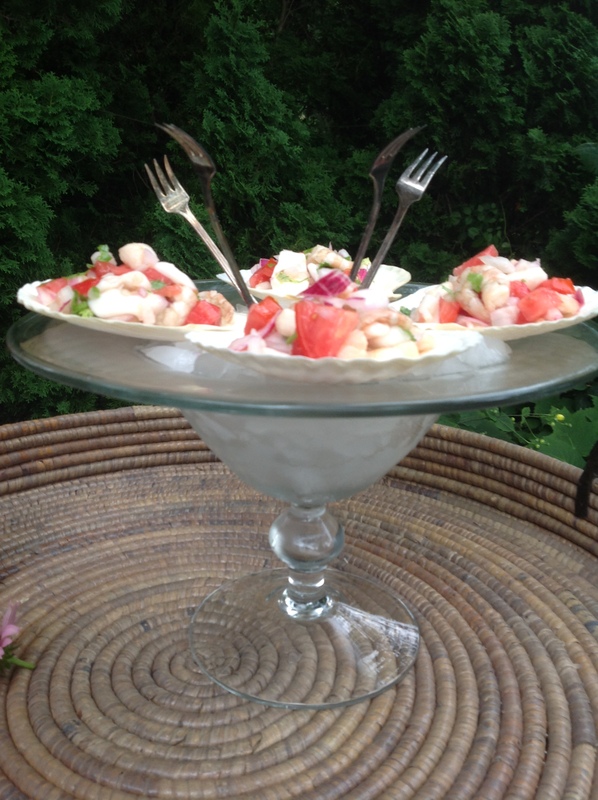 I’ve made ceviche only once, but it wasn’t this pretty!!! That is hard to believe Queen of Presentation Alycia! If you make it again, I’d be honored if you copied this easy presentation idea. Enjoy your weekend A! I looks beautiful Johanne, so elegant! I’ve got a garden hat for you Mollie! Come on over.